Well, not really. I was in a toy store looking for just the right My Little Pony playset (IT WAS A GIFT, OK) when I came across these dolls. 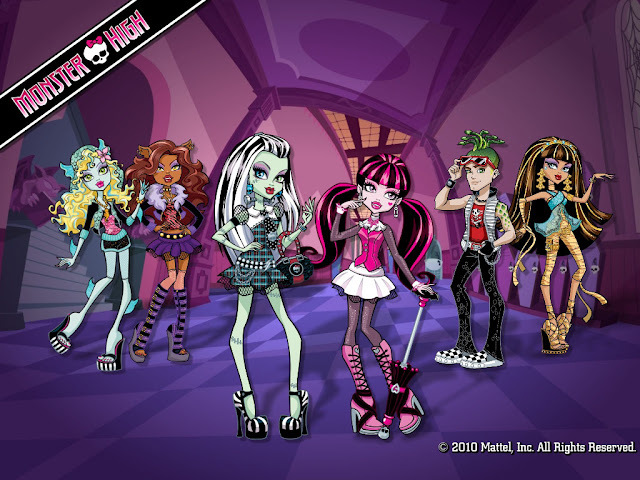 They're called Monster High dolls, and they're based off of real (fictional) monsters from pop culture! They're also really cool looking (I love how they're similar to Barbie dolls but also freaky and twisted) and the packaging for their boxes and attention to detail is amazing. Each doll comes in its own unique box, complete with accessories, a pet that goes with their theme, and a diary (which looks like it actually has stuff written in it but who knows). This is my favourite one by far. She's based on the Creature from the Black Lagoon and she wears fishnets! Ahahah. She carries around a fishbowl with her pet Pirahna in it, which she disguises as a purse so she can take it to class with her. She is actually so awesome. The website itself has a lot of content, most likely to better market the dolls. I was able to create my own student I.D. (with my very own Monster name! note the initials) and they even gave me a class schedule based on a personality quiz I took. You can visit the website (which provided me with a whole 15 or so minutes of entertainment!) here. Okay, now seriously. As for the actual truth behind these dolls. I absolutely love the idea of a doll based off of the original movie monsters, who promote the importance of accepting and cherishing differences in ourselves and others, but other than that, there is still a definite Barbie undertone here. They dress very provocatively for high school students and are all super skinny and tall. Now I know that Frankenstein was tall, but his daughter can't have been that skinny. And what about you, daughter of the Mummy? If your profile is correct and you are indeed 5,842 years old, shouldn't you have some wrinkles by now? I don't think moisturizer made that face. As with all other Barbie products (which you can link to at the bottom of every page), the website is very interactive and certainly fun for younger kids if I found it to be fun, but there are links everywhere to online stores which sell the products. On top of that, there are certain web games which can only be unlocked using product codes found inside boxes of the toys themselves. It made me feel a little like a patsy as I moved around the website, noticing that some of the really cool content was unavailable to me unless I went out and bought the product. The games that were available to play were not all that educational considering these dolls are all supposed to be based in a high school. There is a soccer game, which for some reason they all chose to play wearing high heels, and the only game I played through, Ghoul Juice, promised me a recipe at the end of the game. The recipe, as seen above, consists of little more than sugar and water. Couldn't they have come up with something a little more nutritious? It's not like the companies that make sugar and water are paying them to promote this unhealthy drink! On the whole, these dolls are probably better for your children than an actual Barbie with all of her countless accessories and perfect blonde hair, but the margin is slimmer than I originally thought. Well, it just goes to show, don't judge the monster doll by its packaging. i saw these in the store and was like EMO BARBIE NO WAY. i liked the idea of the diary. Also, you can't buy the male doll by himself. He has to come with someone. And there is only one male. Which is kinda sucky. what if i dont WANT a boy with green hair? p.s. always knew you only had one eye.